The seven tombstones on the Cumberland Lodge No. 8 Lot are for people who died between 1847 and 1861. There were 29 burials on this lot between 1846 and 1922. With the new replacement tombstone for Washington Cooper, who died in 1871, there are now 21 people who do not have tombstones on the Masonic Lot in 2008. No burials have occurred since 1922. On his tombstone, Frederick Smith was identified �Sailor� and �The first rigger on Capitol Hill.� The cornerstone was laid for the new State Capitol in Nashville in 1845. Three years into the construction, in February 1848, Frederick Smith, first rigger, died of spasms. 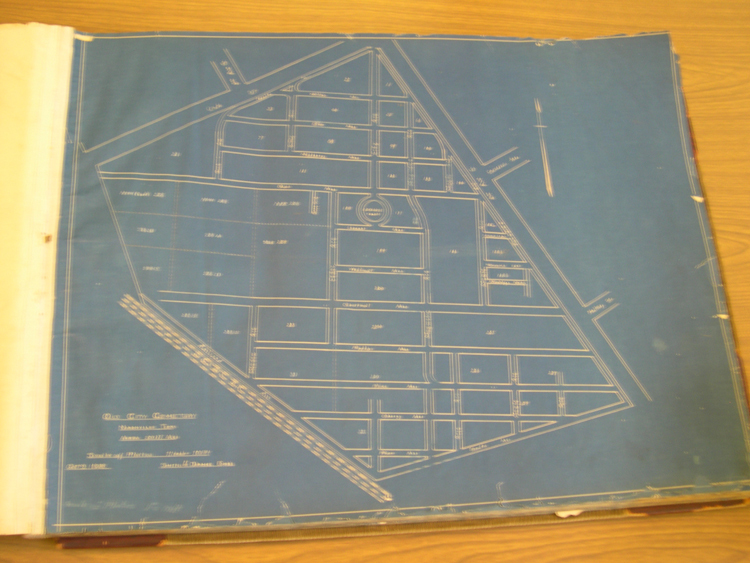 A Philadelphia architect William Strickland won the competition to design the State Capitol. There were many cost overruns and the building was barely completed by outbreak of the Civil War. Robert Armstrong and John Peabody died on the same day. July 4, 1850. On that very day 17 other people died of the same disease and were buried in the City Cemetery. In Nashville, a town of 10,000 people, during the first 4 days of July, 64 people died of that dread disease Cholera. Only the year before James K. Polk, a few months into his retirement from the presidency, died on June 15, 1849, in Nashville of cholera. The remains of the president were placed, with Masonic honors, in a vault at the City Cemetery. On May 22, 1850, his remains were re-interred under a handsome monument, designed by William Strickland, on the front lawn of his home Polk Place. Many years later there was another removal to a final resting place on the State Capitol grounds. Robert Armstrong was born in Scotland. In 1850 he lived in a Nashville household with 22 other thrifty Scots. The obelisk placed over his grave reads �Erected by A Friend.� His monument says that he was 29 years old. John Peabody was born in 1792 and died On July 4th 1850, at age 58, of cholera. The 1850 U.S. Census gives two �John Peabody� of his age: one lived in Groton, Massachusetts & one in Erie, Michigan. This handsome monument was not erected at his burial site until after 1908. Persons with more information about John Peabody�s monument, please contact the Nashville City Cemetery Association. Name was spelled �Frank� in the Interment Book. He was born in Edinburgh, Scotland. In 1850 he and his wife Cateren, 19, and child Emma, 1 year old, lived in Philadelphia. He was 30 years old when he died in Nashville of consumption on December 21, 1858. Colonel Laird, as he was listed, 34 years old, in the City Cemetery Interment Book. He died of consumption, which we now call tuberculosis. In 1860, Laird was listed in a household of ten people in what is today downtown Nashville. He left a wife, Martha, aged 23, and a 3 year old son. Was he a war casualty? The Civil War had begun six months before his death. He died on Oct. 31, 1861. There was a James A. Laird listed in Neely�s 14th Regiment Tennessee Cavalry (CSA). Persons with more information about James A. Laird, please contact the Nashville City Cemetery Association. Replacement tombstone dedicated by Cumberland Lodge No. 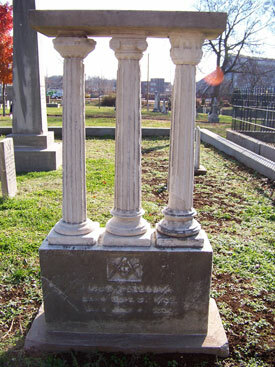 8 on May 11, 2008, in the presence of a gathering of Masons, Nashville City Cemetery Association Board members and his descendant William R. Cooper.- See bottom images for the Masons. CUMBERLAND LODGE NO. 8, F. and A.M.--- Called Meeting, this (Thursday) morning, 22nd inst. at 9 o�clock, to attend the funeral of Brother Washington Cooper. Brother Cooper was one of the oldest Masons in the city, and one of the original members of Cumberland Lodge. All Masons in good standing are also invited. By order of the W.M. CLICK HERE to see article from Republican Banner, Friday, July 2, 1869 - "Old Memories. Personal Reminiscences of Distinguished Nashville Masons" by Anson Nelson. Marshall, W. W., Lnt. 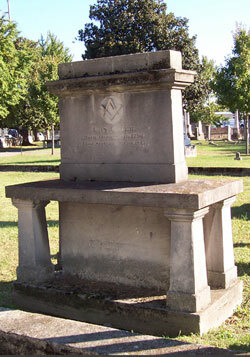 - 25 - M W - City - S. Feever - Central Lot - Masonic Lot - A Citizen of Monroe Co.
Cumberland Lodge No. 8 F.A.M. In addition, 3 tombstones were shown on 1908 Plat Map but without legible inscriptions. Note: Little Genie. No tombstone in 2007. Note: John Peabody. No tombstone in 1908. Tombstone in 2006 & 2007. Tennessee State Library & Archives. Accession Number 73-26. On Microfilm. Minutes reported attendance of Masons at funerals of their Lodge members. Mention was made of the payment for services to local undertakers. Only eight (8) tombstones are located, in 2007, in the Masonic Lot at the City Cemetery. There were 29 burials on the Masonic Lot between 1846 -1922. Consideration should be given to the placement of an historical marker in remembrance of the other Masons buried on Cumberland Lodge No. 8 Lot in the Nashville City Cemetery. In the future it is possible that descendants will want to discuss with the Metro Historical Commission about replacement tombstones. Masonic lot, A citizen of Monroe Co.